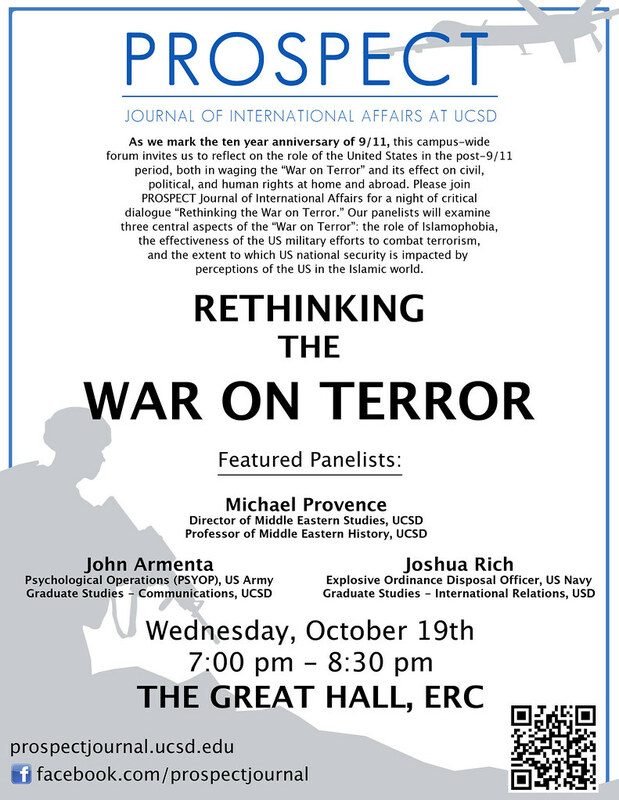 Welcome to the live blog of tonight’s Prospect event, “Rethinking the War on Terror”. Together with Prospect Editor-in-Chief Megan Magee, I’ll be relaying tonight’s discussion. I hope you enjoy. Michael Provence is Associate Professor in the History Department at UCSD. He has lived and studied in Syria, Lebanon, Egypt and Turkey. He is the author of The Great Syrian Revolt and several articles on the Ottoman Empire and the Middle East in the early 20th century. John Armenta served in the US Army Reserve in a Psychological Operations unit. During his enlistment, Armenta was deployed to Bosnia, Qatar, Iraq, and Afghanistan. Armenta is currently a graduate student in the Communications department at UCSD. Joshua Rich graduated from Texas A&M in 2003 and was commissioned as an officer in the US Navy the same year. Rich graduated from Navy Dive School in 2003 and was later deployed to Afghanistan, where he served as an Explosive Ordinance Disposal officer. He is currently pursuing a Master’s degree in International Relations at USD. To begin, panel member John Armenta argues that the US wastes time, labor and money that could be used to fight terror when we focus instead on promoting Islamophobia, which creates counterproductive generalizations like “even moderate Muslims support terrorism.” If more people think we are at war with Islam, the more these generalizations will happen. Dr. Provence emphasizes that John and Joshua have both made good points. When US soldiers go to foreign countries and meet people, it’s hard to not imagine them as human beings. “Islamophobia starts at the top.” and the events that triggered the events of the last ten years is something the United States need to critically examine. 9/11 was a criminal conspiracy, Dr. Provence argues, and the US response to it has been massively out of proportion, at enormous cost to the world. “The last decade was a period of temporary madness on the part of the American political leadership,” Dr. Provence states, and the actions of the Obama Administration have demonstrated that the US hasn’t recovered from this mistaken strategy. How effective has the US military been at combating Islamic terrorism in the decade since 9-11? Dr. Provence responds that he does not know the answer to this question. He explains that if the definition, hypothesis, or thesis in a paper are flawed, if the premise is wrong when asking a question, you cannot access the truth value of an argument. With a faulty structural premise for the war on terror, there is basically nothing good that can come of occupying countries militarily. For Josh: would you like to mention what it was like in Afghanistan with regards to the question? Josh argues that not all hope is lost. We aren’t handling Afghanistan in the same way we handled the Vietnam war, where the strategy was to kill as much as possible. The tactic that is working and will work is training Afghans and engaging in special operations. 16,000 Americans were killed in Vietnam and we are nowhere near that, though there were surely mistakes made during the Afghan war. The situation in 2001 held better prospects and opportunity – the military had defeated the Taliban – and where we have ended up is a shame. What tactics and strategies have been effective, and which have not? What are some of the costs and benefits of controversial US strategies like drone strikes in Afghanistan and Pakistan? Dr. Provence replies that he doesn’t personally know the answer to this question. Instead, he answers with a metaphor: if the definition, hypothesis, or thesis in a paper are flawed, if the premise is wrong when asking a question, you cannot access the truth value of an argument. With the faulty structural premise of the war on terror, the likelihood of a successful outcome of US military operations in the Middle East becomes vanishingly small. Mr. Rich argues that not all hope is lost. We aren’t handling Afghanistan in the same way we handled the Vietnam war, where the strategy was to kill as much as possible — the famous “body count” logic. The tactic that is working and will work is training Afghans and engaging in special operations. Roughly 50,000 Americans were killed in Vietnam and the US is nowhere near that level of losses in the Iraq and Afghan wars, though mistakes have certainly been made. The situation in 2001 held better prospects and opportunity — the military had defeated the Taliban — and where we have ended up is a shame. Mr. Armenta argues that we have always faced the problem in Iraq and Afghanistan the fact that local people are against US military intervention. Counterinsurgency, while imperfect, seems to be a better way to address issues. Helping people by taking support away from terrorists, even if they don’t fully support the US, is valuable. There will always be groups and individuals who refuse to surrender, and that’s where counterterrorism comes in. Drones (like the General Atomics MQ-1 Predator and MQ-9 Reaper) are primarily built here in the San Diego area, Dr. Provence points out, so they affect our economy directly. Other costs and benefits of drone warfare are more abstract. The cost of the War on Terror to each world citizen is high — a gallon of gas now costs $4 whereas it cost far less in 2002 — a price increase Provence argues is due to the War on Terror. The cost of conflict is immeasurably high. The costs in soldiers, as John Armenta argues, isn’t high, but the cost in dollars is extremely high. On the same theme Dr. Provence points out that one year of defense appropriations — not war — would be sufficient to fund every one of the 10 University of California campuses with nobody paying tuition for 52 years. That is less than $1 trillion dollars, which helps to put the wartime propagated debt of $5 trillion into perspective. Dr. Provence remarks that he can see from the audiences’ faces that they are unhappy to hear this, as he is. Joshua Rich argues that one benefit of US war spending is that many Soldiers, Sailors, Airman, and Marines have acquired the opportunity for a paid education that they would not have otherwise enjoyed. Returning to the cost/benefit dilemma of drone warfare, Mr. Rich remarks that small drones are cheaper than an M-16, allowing for significant cost reductions. Similarly, the flexibility of drones means that US service members now have a ‘middle option’ of taking out the bad guys instead of civilians. Mr. Armenta responds that while drones can be used well, they make war too easy and too cheap. It enables the removal of ground troops in favor of just one Airman to fly in and push a button. This logic has the potential to lower the costs of war, lowering the psychological threshold required to go to war and perhaps making politicians more likely to enter conflicts. John Armenta responds that it is important to put yourself in another’s shoes, and the US political establishment must agree not to do anything that is overtly racist and hateful. Unfortunately, Mr. Armenta argues, this is not going to happen. He references the so-called Ground Zero mosque and American reactions, and how Muslims witnessed anti-Muslim sentiment in the US and felt that it was a larger element of American opinion than it was. This is because the voices of bigots sometimes stood out above the others. However, some religious authorities came forward and attacked anti-Islamic sentiment. The key is to establish empathy with the other. Thanks for tuning in, and apologies to our speakers — due to the constraints of blogging live, this live blog doesn’t do their comments full justice. We’re now entering our questions and answers segment, where our speakers will take questions from our live audience and a from our Twitter followers. Thanks all around, and please continue to check out Prospect’s content and events. You can follow question and reactions to this event on Twitter, #prospectconnect. Update: Mildly edited for clarity — due to being written live, some phrasing was unclear or incomplete. Apologies for any confusion. I think the publisher of this blog did a very good job at photoshopping Provence’s arrogance. It’s all to unfortunate that the impact he made tonight could have been more positive upon his audience. I think this is a prime example of how people and mass media like to interview people who are not specifically qualified to answer such questions. Provence stated that he interviewed a lot of Iraqi’s and that “there is an Iraqi refugee on every corner in San Diego.” This statement makes me believe that he obviously hasn’t walked the streets of San Diego or Iraq and Afghanistan. Let’s try to pick better qualified candidates next time. People who have actually had hands on experience in the countries we are discussing please. Other than that I thought that Armenta’s argument about utilizing drones would make making executive decisions on war that much easier was fascinating! I had never looked at the usage of drone’s in that manner and I see his point completely! If we take the human askpect out of war then it becomes a video game and that is not acceptable. However, I personally utilized drones on the battle front and they have saved several lives so if we continue to utilize them the way we already do and have done then it can be a huge success. I hope you might visit Dr. Wael al-Delaimy here at UCSD. Professor al-Delaimy hails from a family of distinguished Iraqi scholars and physicians, and most of his extended family is now refugees from Iraq. He is a well-known scholar of public health and can address the situation in Iraq since 2003 and before from his study and personal experience. I am sure he would glad to hear from you.